Santa Perfitt Jimenz weaving with her backstrap loom. As readers of this blog know, I have a big interest in weaving. It was enough to get me to Scotland and it may be enough to get me to Guatemala. 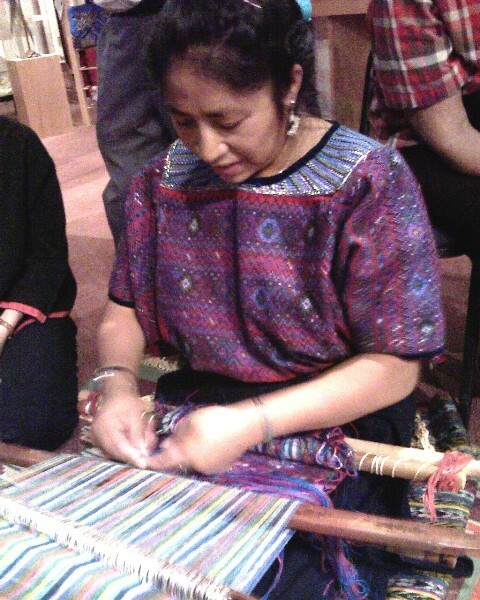 Recently, a friend forwarded me information about a new exhibit at the Hearst Museum of Anthropology at UC Berkeley on Guatemalan weaving, and about a demonstration of traditional Guatemalan backstrap weaving. I went, of course. Seeing this weaving has inspired me to think that my next big ramble may be to Guatemala, where I can see both weaving and Mayan ruins. I want to share with you three things from that exhibit: backstrap weaving, ikat weaving and a very cool optical illusion. If you are inspired, please go see the exhibit yourself. It is on display for approximately the next year. 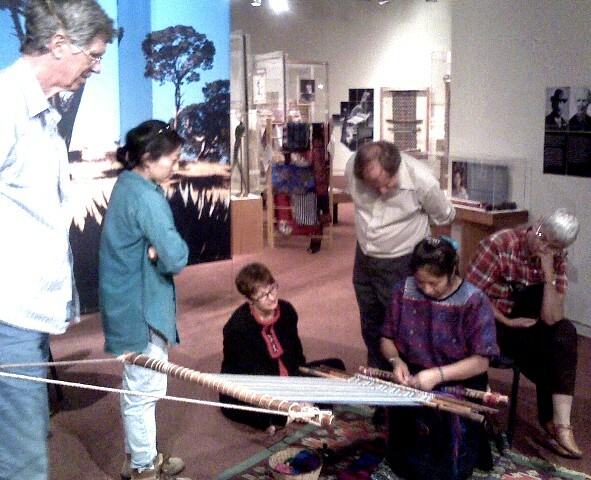 The exhibit is made up from the Museum’s large and varied permanent collection of Guatemalan weaving. Santa Perfitt Jimenz set up her backstrap loom and wove for an hour as she talked about growing up in Guatemala and learning to weave from her mother and other women in her village. Her loom was simple, as expected of a backstrap loom, but the weaving itself was anything but. Her weaving was a form of tapestry, where individual weft threads were woven by hand across a few warp threads to create complex and colorful patterns. She was fast at this process, doing it without much thinking, while she focused her attention on answering the group’s questions. These patterns are ones she learned from her village and, despite their complexity, are not written down in pattern books, but just learned with practice. In her weaving, and other examples on display, I noticed something I’ve never seen in weaving or tapestry before. 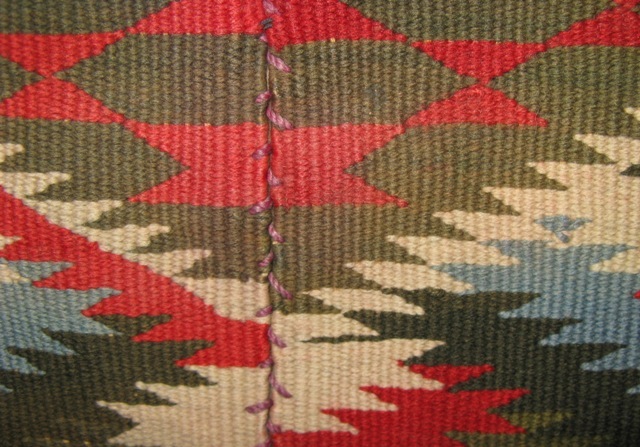 Other forms of tapestry (French and Navaho) are weft-faced, that is, only the weft threads show. Other kinds of weaving, for example a long woven belt, are often warp-faced, that is, only the warp threads show. (In some weavings, such as Scottish tartan plaids, both the warp and weft threads show.) 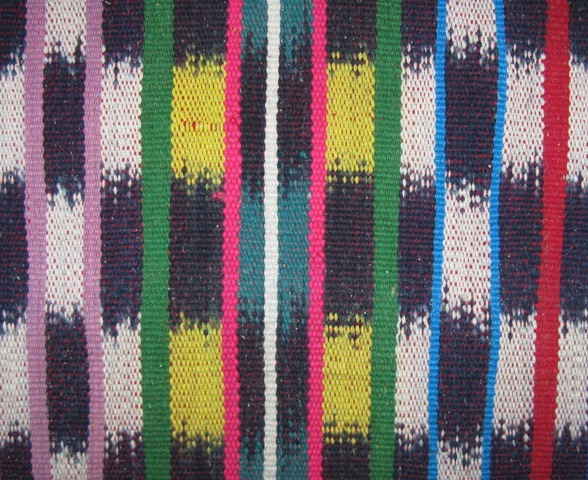 In this Guatemalan weaving, I found pieces that are both warp- and weft-faced, but in different locations in the fabric. Dyed warp threads provide a colorful and simple background for part of a piece, often identified by a striped pattern, then an even more colorful and complex weft-faced pattern is woven in next to it. The lower blue and red striped portion is warp-faced and the upper decorative portion is weft-faced. Check the pictures here and if you look closely, you can see in the piece that is blue with red stripes on the bottom and patterned on top how this is done. The effect provides a beautiful figure-ground contrast. Floor looms have been used in Guatemala since the Spanish arrived centuries ago. The exhibit contains many larger pieces made on floor looms. The most interesting to me were examples of ikat weaving. 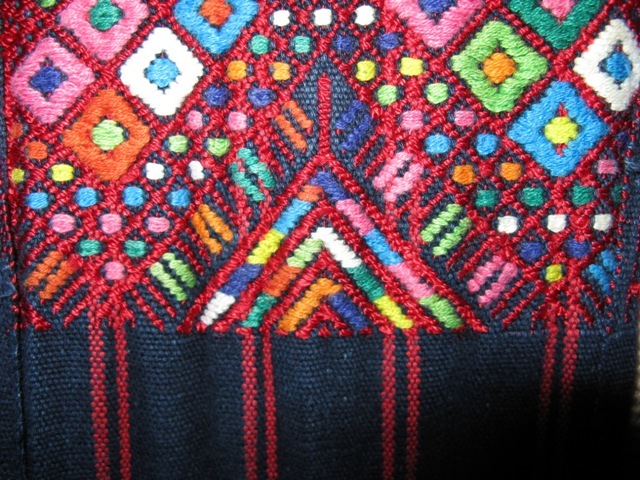 While this process is not unique to Guatemala, the examples on display illustrate the complex designs that can be made by using it. Ikat involves a process of tie-dying thread. Shanks of thread are tied tightly at specific intervals to resist dye, then the shank is dyed, leaving undyed white thread where it was tied. 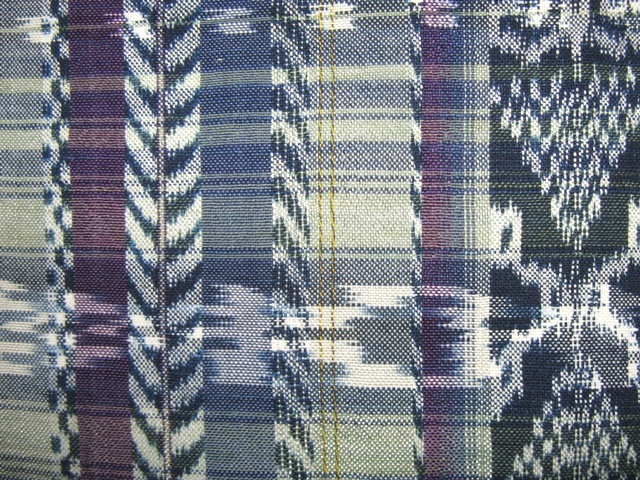 The block pattern is a warp-faced pattern of ikat dying. The weaving I saw was, I believe, simple plain weave. But, by carefully calculating where to dye the warp and weft threads, complex patterns emerge in the cloth. In the photos, I provide examples of one simple piece with alternating white and colored bars. This is a simple pattern, with ikat used on warp threads only. It gives an idea of the beautiful patterns that can be achieved with dying complexity rather than weaving complexity. Another photo shows a highly complex pattern, made up of ikat-dyed warp and weft threads. It’s beautiful. This complex pattern is made entirely from dye patterns, not from any complex weaving. Note the detail patterning and how well it meshes where the two pieces were stitched together. One of my favorite weavings in the exhibit is one that is deceptively simple. Closeup, you can see the tapestry pattern woven in on two separate panels, each produced individually on a backstrap loom, then stitched together. I studied this at a very close distance, noting how the patterns were constructed and how well the two separate panels meshed together. As I walked away, a gentleman about 10 yards away told me to turn around and look again. I turned and stared, and stared, wondering what he wanted me to see. Suddenly, the overall pattern popped out at me, revealing an optical illusion of inter-woven diagonal stripes. As a cognitive psychologist, I loved the pop-out effect and illusion. As someone who appreciates tapesty, I appreciated the complexity of the pattern. In some ways, it reminded me of Navajo eye-dazzler patterns.